Hybrid AGL requires NO CCR, NO Transformers, NO Cables. Hybrid system is the system that can be energized by different power sources. SP-401 lighting unit is powered by deep-cycle battery providing up to 80 hrs of autonomy. The battery can be energized in three different ways: via solar panel, electrical installation or charging station. To achieve highest level of redundancy SP-401 can be energized via solar panel and cable simultaneously. This way unit is using solar energy to charge batteries. When there is not enough solar energy – unit will start using power provided by electrical grid. To achieve highest possible energy efficiency – solar panels in S4GA units are installed independently from the lighting unit. This unique feature allows to maximize solar energy collection. Why? Entire solar panel is facing one side and can be tilted in accordance with geographical latitude. How can S4GA Hybrid AGL generate 4x more electrical energy then traditional products? There are usually 4 small solar panels located on the walls of the lighting unit which means that only one panel is facing preferred direction (e.g. South in Northern Hemisphere). Thus the other 3 panels are providing only minimum power. All 4 solar panels are installed 90 degrees to horizontal plane which also significantly limits their efficiency as compared to optimal tilt (20-30 degrees). In case of manufacturers of traditional solar AGL – total solar panel nominal power is usually 20W. However as it is made of 4 solar panels (4 walls) – Only one side can face the sun. This means that only 25% of solar array is working full time. Other 3 sides are working only partially. Thus instead of 20W – unit only utilizes 8-10W. (as you can see in some products available on the market). Typical tilt that is used in Europe is 35-40 degree. In locations that are close to equator optimal tilt should be even smaller 5-7 degrees. Certain manufacturers mount solar panels into the walls. 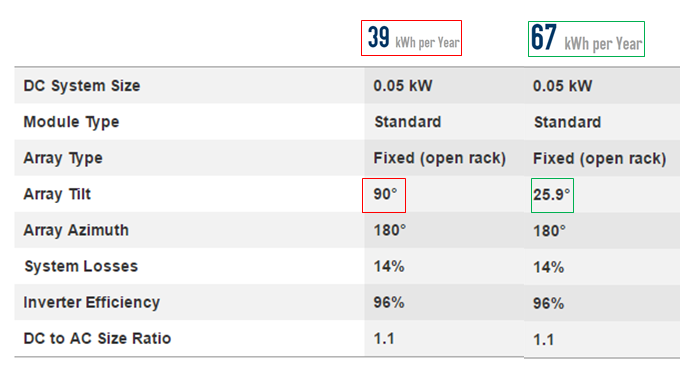 Thus solar arrays installed 90 degrees to horizon plate are providing 40% less energy comparing to optimal tilt. 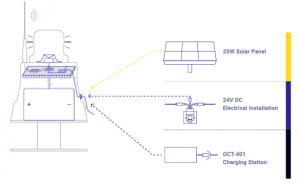 For example: solar panel of 50W power output with 90-degree tilt would produce 40% less energy comparing to optimal tilt To sum-up – in fixed (permanent) runway lighting systems independently installed solar panel should be used in order to maximize solar energy collection. For the wireless communication S4GA uses encoded 868 Mhz frequency with as little as 16mW power output. 868 MHz is the kind of frequency that requires no special approval in most of the countries. There are some manufacturers that are using 900 Mhz frequency which is usually used by GSM providers. This frequency often requires special approval to be used by the airport. S4GA optics is ICAO compliant (we use special TIR design). It means that light emission is precisely directed within angles required by aviation regulations. 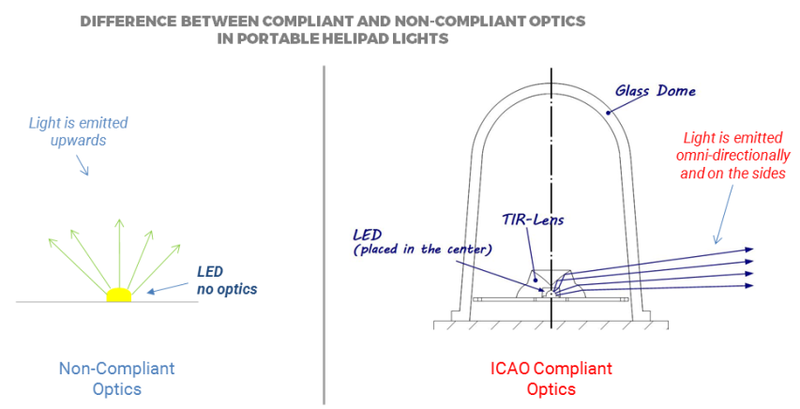 Some other manufacturers simply have LED installed on the electronic board and apply NO special optics which means that their lights are non-compliant with ICAO and also light is directed upwards instead of sideward. In practice, it means lower visibility range as instead of focusing light around itself the lighting fixture is emitting light into the skies. 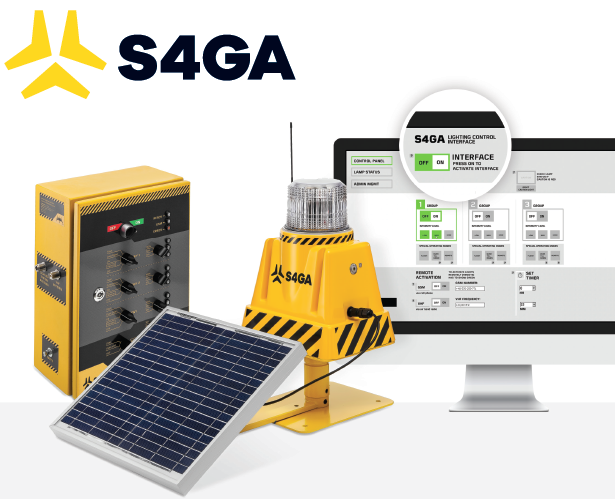 S4GA Hybrid Airfield Ground Lighting offers revolutionary Airport Lighting Control and Monitoring System (ALCMS) that enables control over entire system and individual light unit monitoring (battery level, charging status and operating condition). Hybrid AGL users can remotely control entire system or groups of lights. S4GA ALCMS offers individual light monitoring. Monitoring includes such parameters of light as: battery level, charging speed, temperature, operating status, etc. We do not limit our customers. 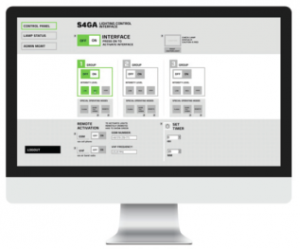 Every S4GA unit can be converted for another application. Today you can use your lighting unit as runway edge light but tomorrow as taxiway, helipad or obstruction marking. Optical conversion requires obtaining additional optical head. S4GA lighting unit has exchangeable battery. Every customer can replace battery by himself. Battery exchange takes only 20 minutes. What is more important batteries that are used in S4GA systems are high quality batteries that are available all over the World. Our customers can easily source battery whenever they are. S4GA lights are modular. We do not force customer to buy all-in-one. They can buy lighting unit separately from solar and mounting. This means that they can gradually upgrade their system: first buy lighting units (plain), then add solar and mounting and finalize by obtaining control & monitoring system. S4GA Hybrid Lighting outperforms competitors’ products because S4GA designed and certified completely new type of product – Hybrid AGL. It is aimed to be used by airports as primary (not temporary) lighting system.